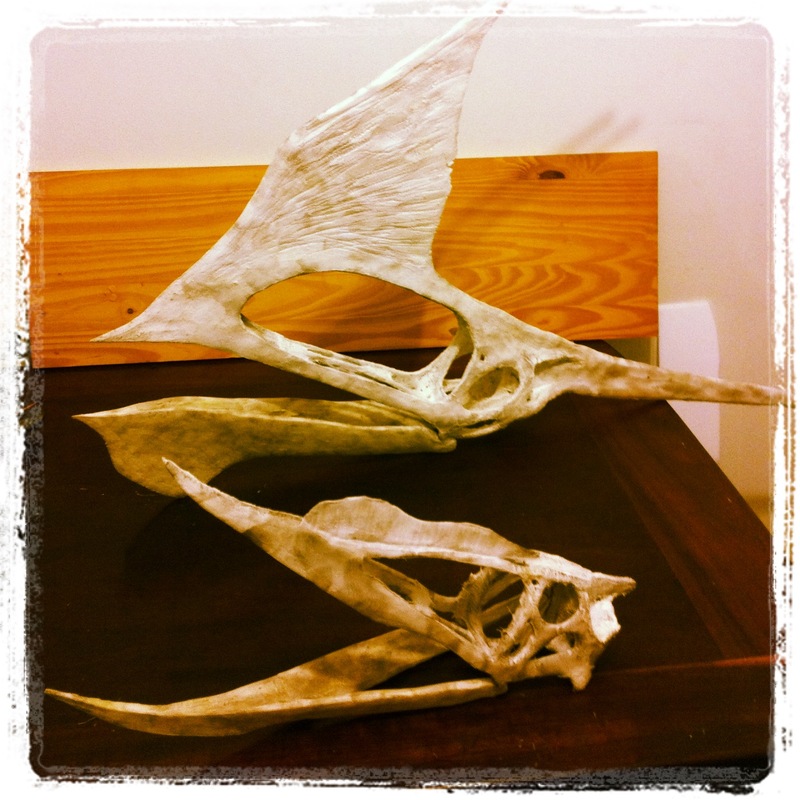 I am making two skulls at the same time. It’s more productive. When one is drying I work on the other. 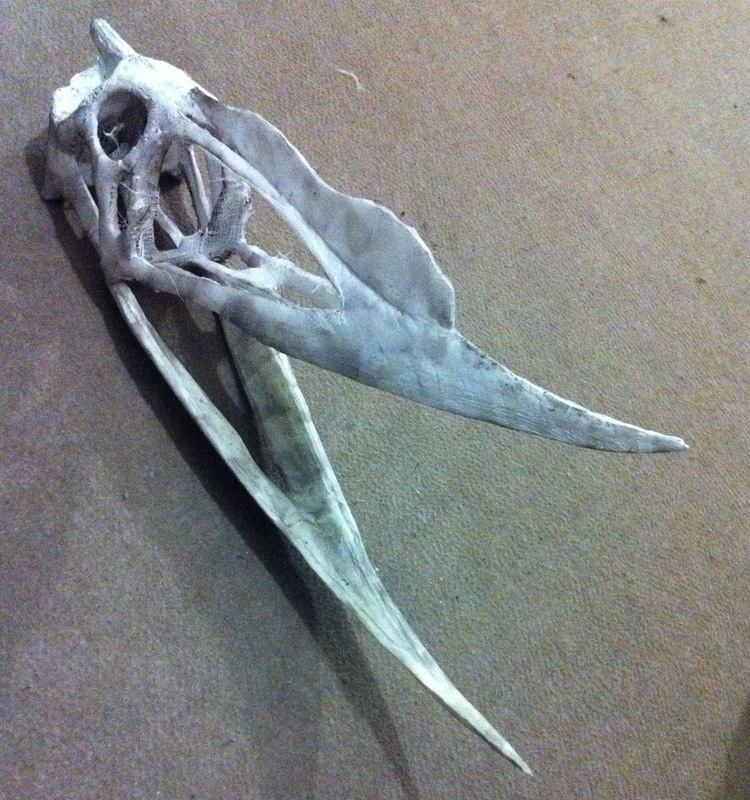 So now the Tupandactylus is nearly finished. It just needs some work on the rear crest, some sanding, staining and that’s it. 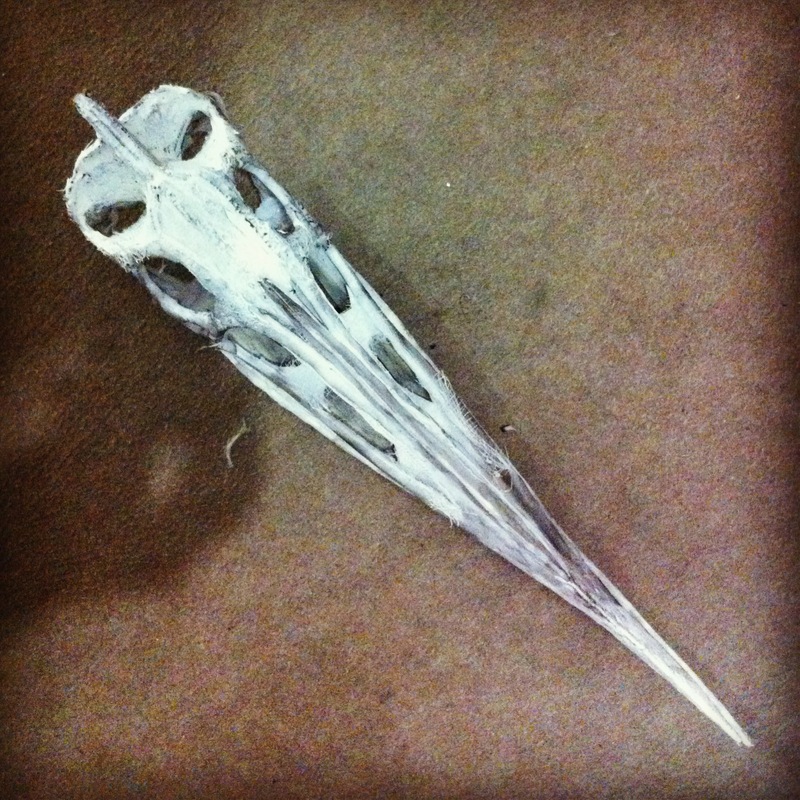 This is a close-up of the head with the mandible in place (I already finished the mandible that’s why it is in a different color). This is what it looks like when you are behind a dead Tupandactylus. And when you look down at it from above. And here is another family portrait, this time showing the still unfinished Imaginary Pterosaurs #3 (Tupandactylus) and #4 (Unnamed Toothless Dsungapterid). 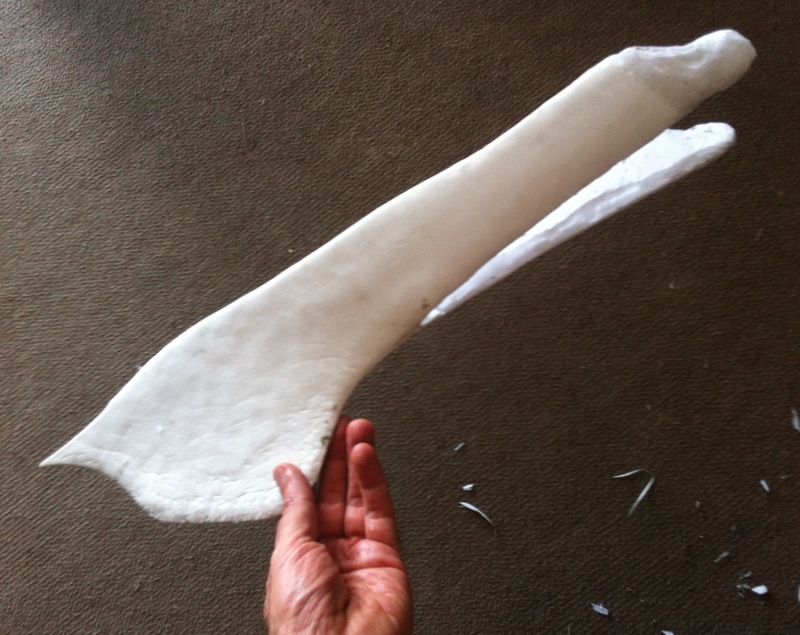 Almost all the foam work is done for Tupandactylus. 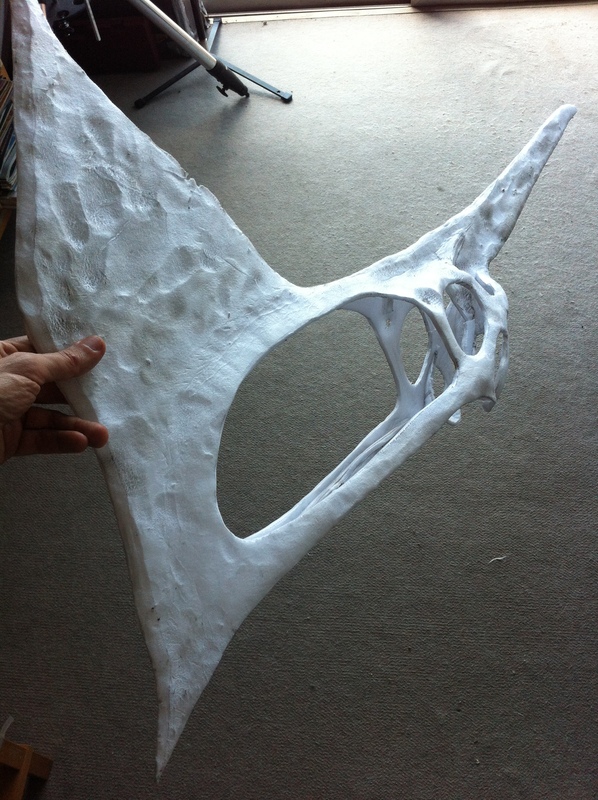 Now I will coat it with acrylic resin and use gauze + resin to fill in cavities. 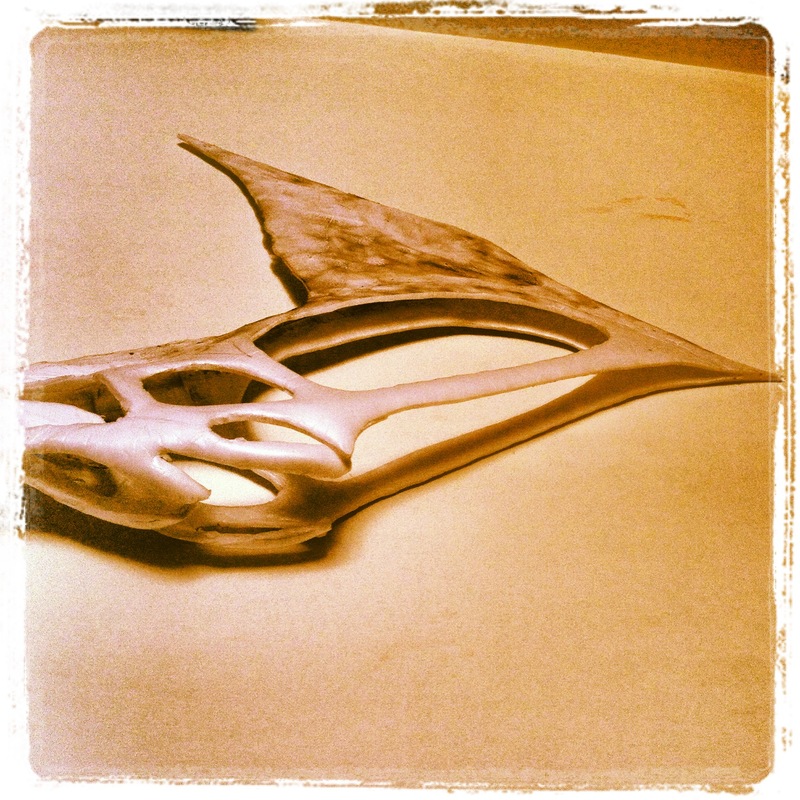 This the mandible. 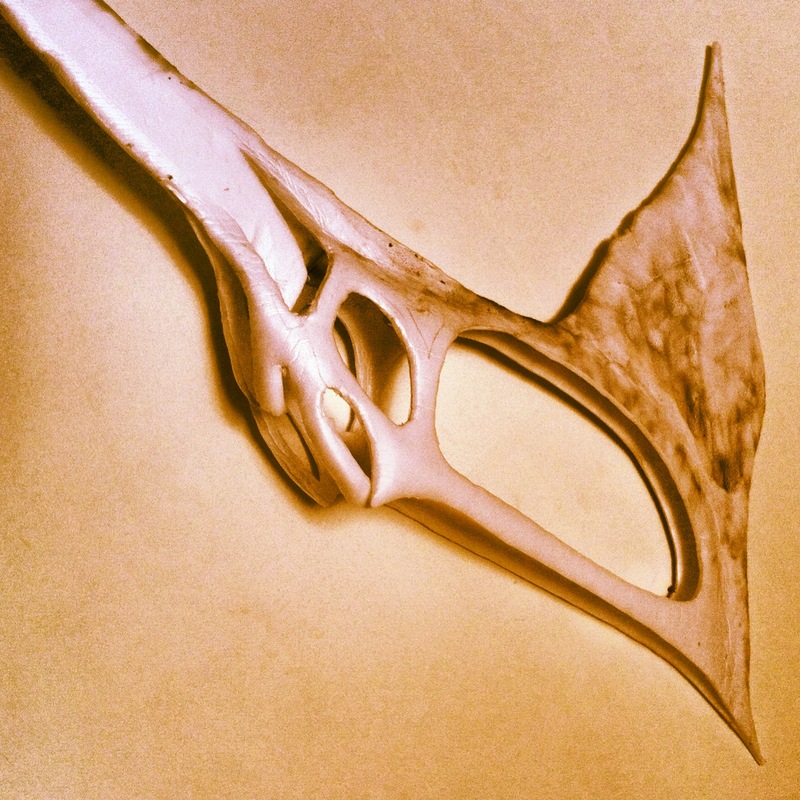 This is the inner part of the mandible. 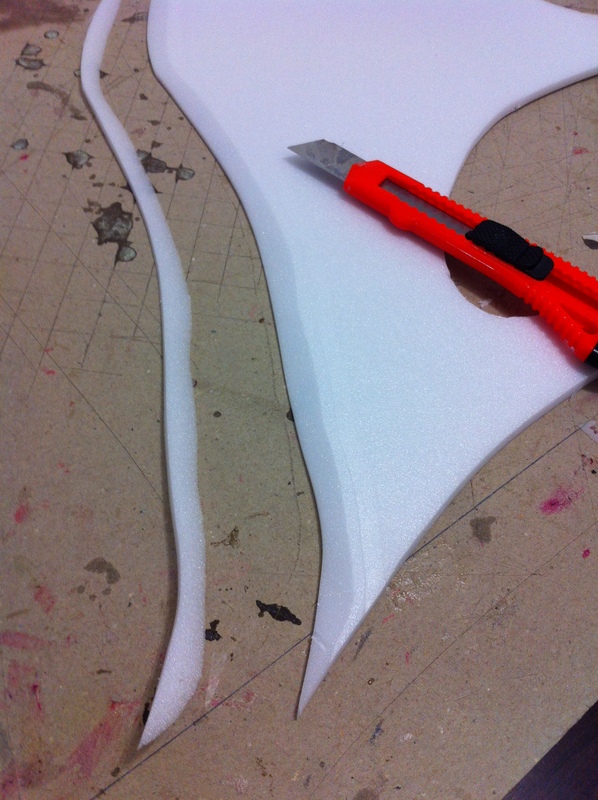 These cracks I will fill later with the acrylic resin (modelling paste). 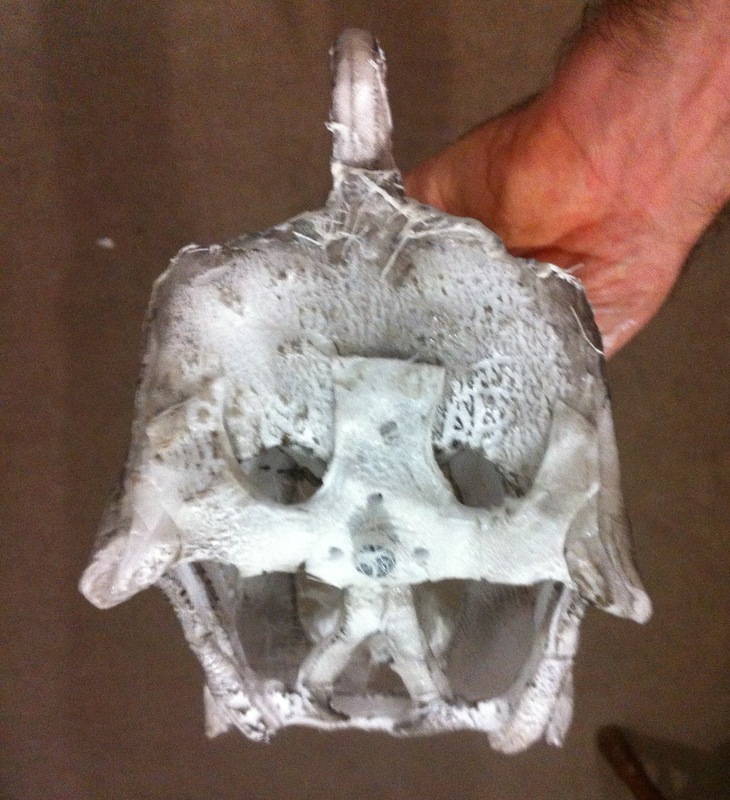 I also worked on the details inside the head, the brain case, the orbit and temporal cavities. 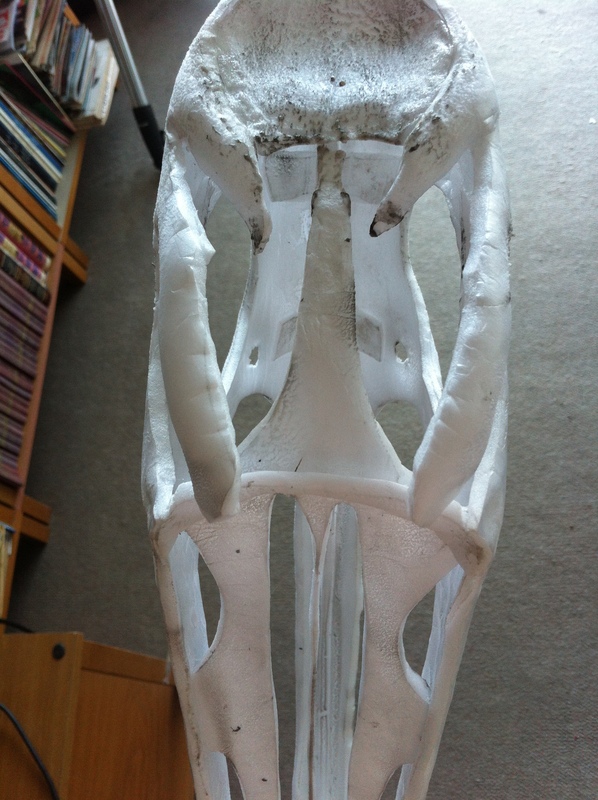 This is a view from the back of the head showing the upper temporal fenestra and parietal bones. 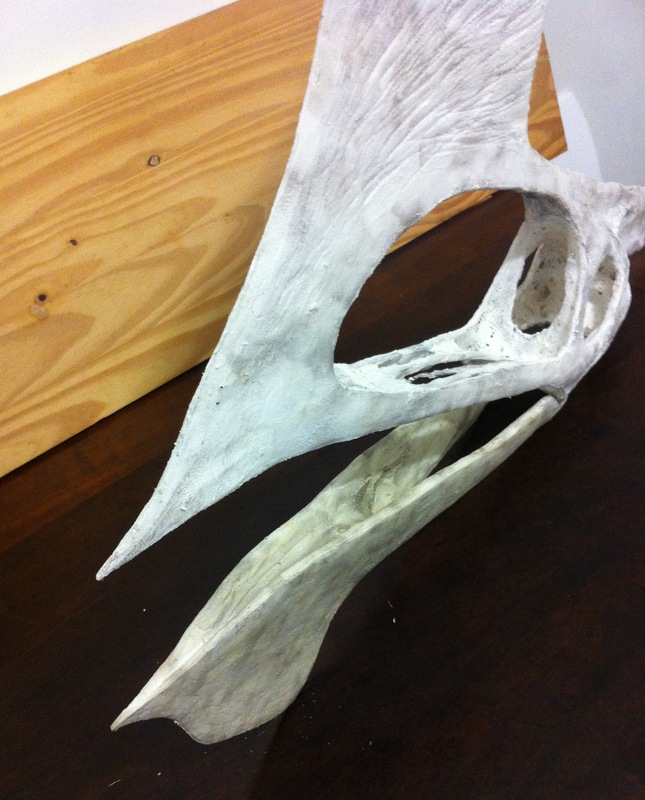 This is the back and bottom of the skull. The shiny round piece of plastic on the left side is part of the occipital bone, where the cervical spine will be attached. I have to reinforce this later with epoxy resin since I hope to be able to make a detachable yet strong connection for the spine. 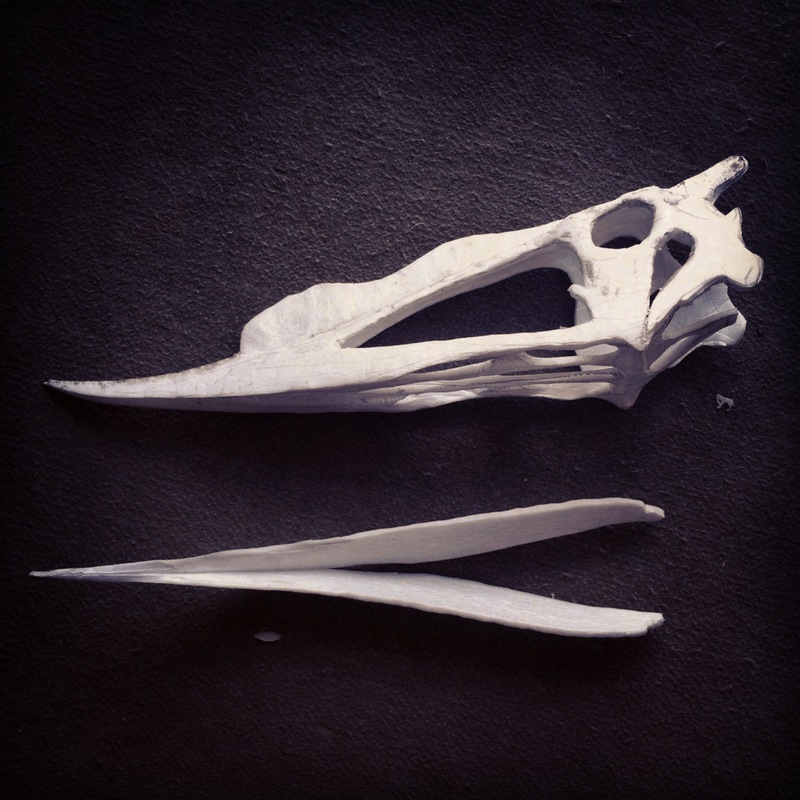 I still do a lot of guesswork since I don’t have enough pictures of the pterosaurs I am making, and I have only just recently started studying a bit about skulls. I am, as usual, relying on the fact that I can always fix it later as I have done so far: research a bit, do it, see what is not right, research again, fix it, and so on. 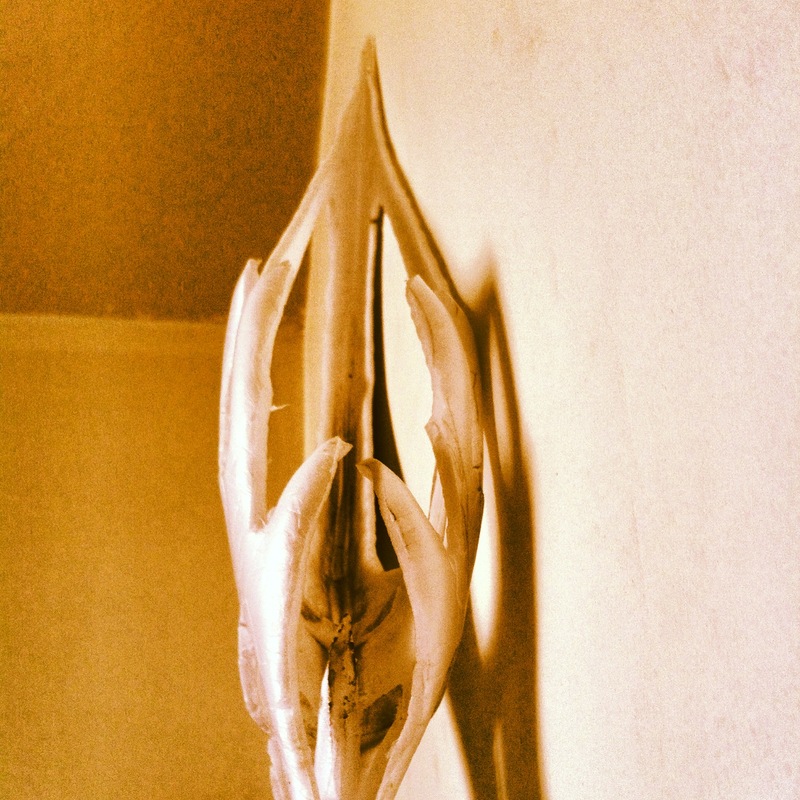 It is a good method because I can quickly start working on a three-dimensional sketch. I can test it and see what does and does not work (instead of spending a long time investigating drawings and pictures and reading scientific papers that I do not have enough background to yet understand). By testing, I can better understand the structural purpose of each bone, and it helps me direct my research to the problem I need to solve. When I do additional research after that, it is much more productive, and interesting. 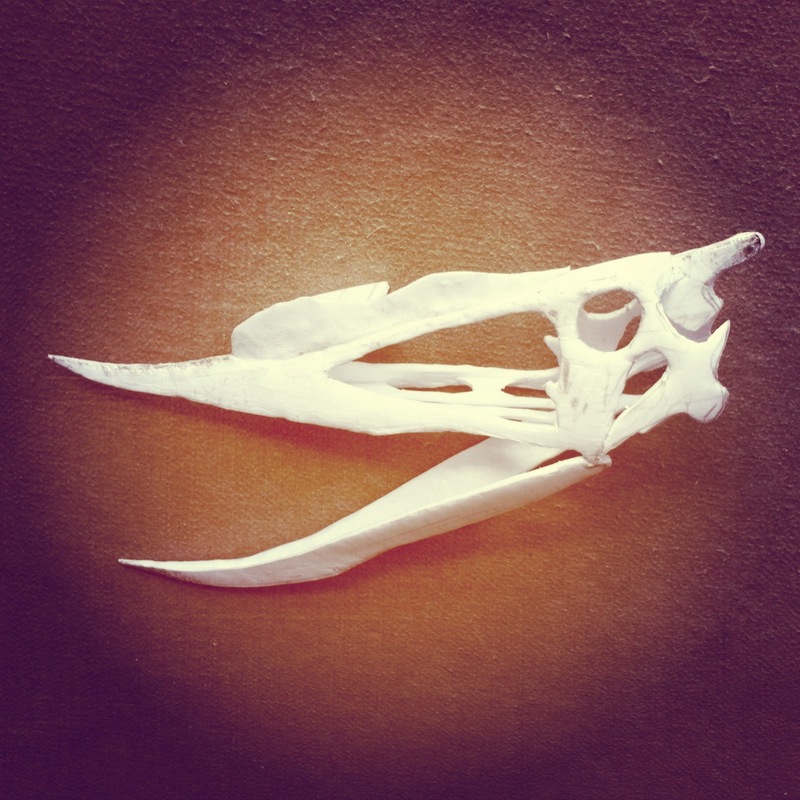 When I read a scientific paper after working on a 3D model, I can understand a lot more. 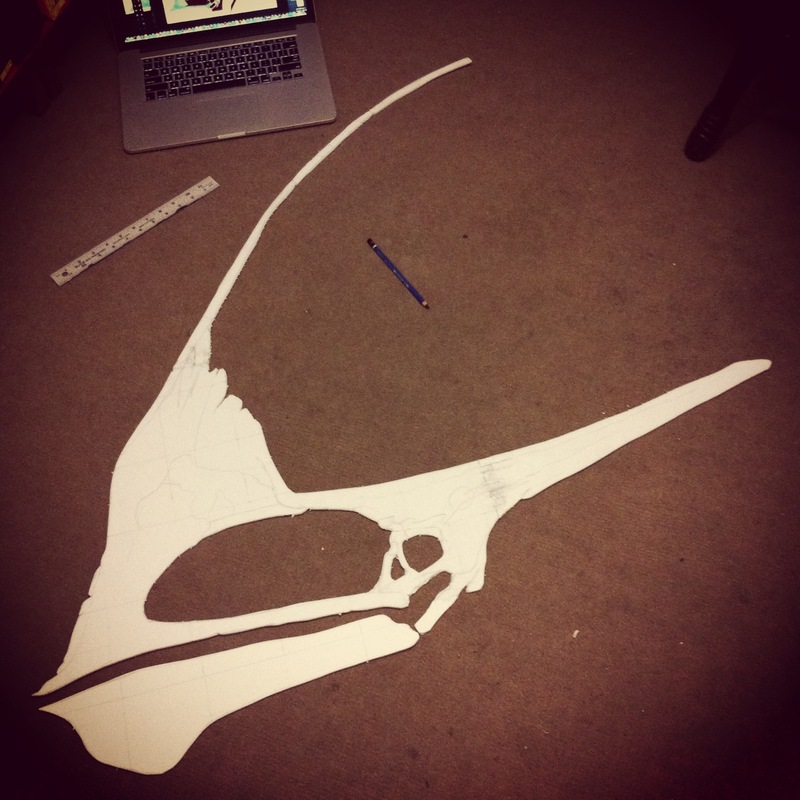 While I am making the Tupandactylus, I am also working on a toothless dsungaripterid. 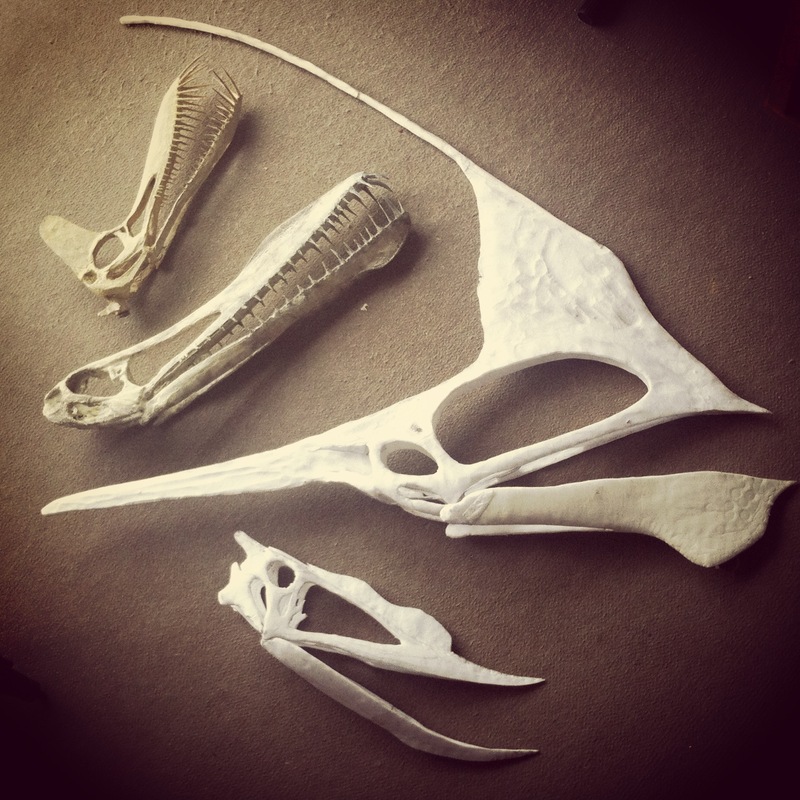 Here is a family portrait of all four Imaginary Pterosaurs. 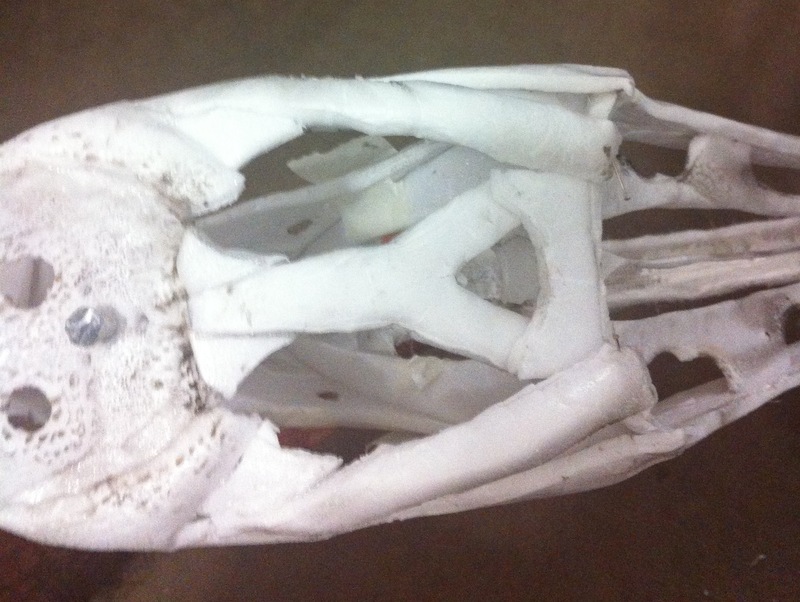 This is the skull after attaching both halves together and molding. These are just two halves cut from a 5mm think XPS foam sheet, glued together at the edges, and molded out by folding (it won’t snap if you press before folding – see the previous post). It is still too flat, of course. 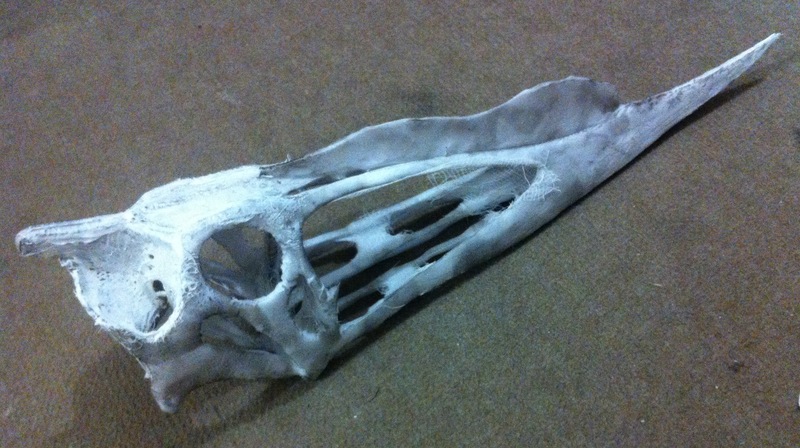 I pasted pieces of foam on the inside to help shape the head, and then added some “bone” inside the beak. 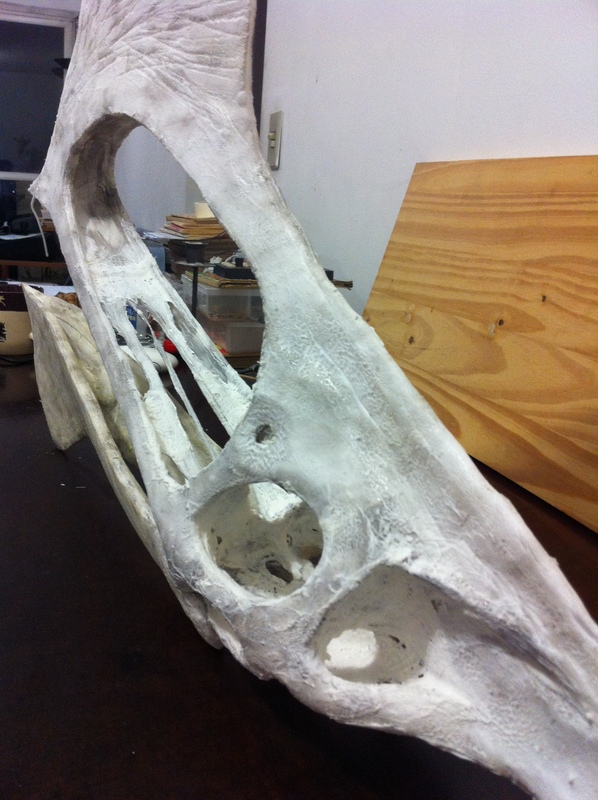 I also added a piece of foam just below the braincase to help keep the head rounded. It’s a sketch of the occipital bone. 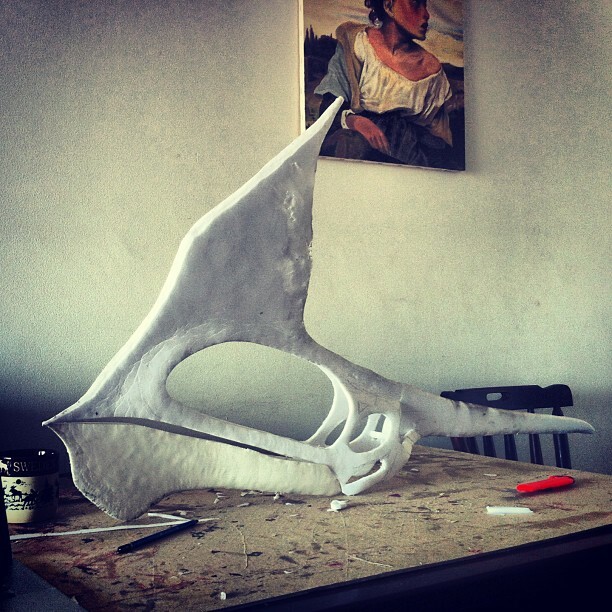 Later I will reshape it, add the cavities and the protuberance which attaches to the first cervical vertebra. For now, it is just a flat surface. I don’t know if these bones in the middle really exist (I urgently have to study vertebrate skull anatomy), but it’s working great so far to keep everything in place. 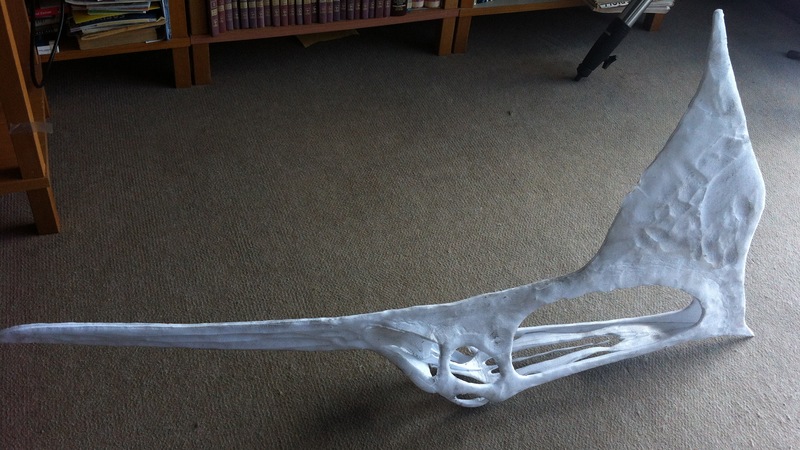 I worked a bit on the mandible. I still have to close it on the inside. 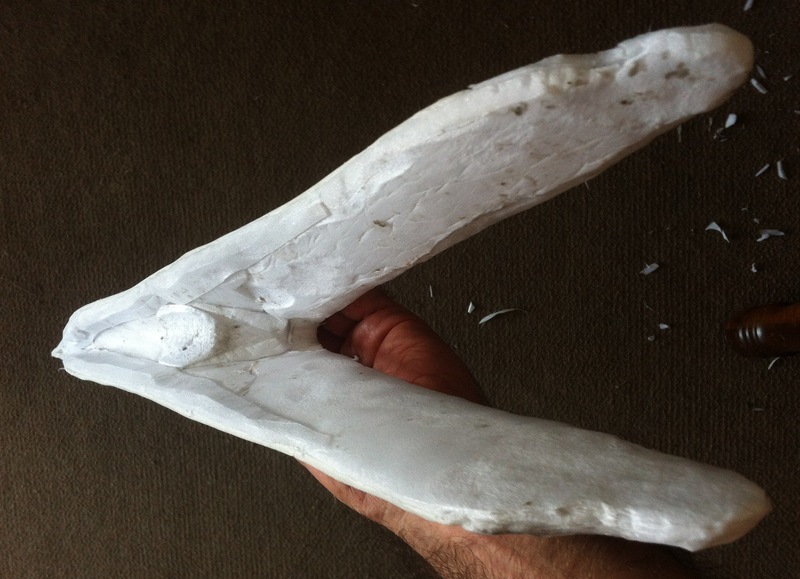 I also discovered that it is too short and doesn’t really fit well with the upper beak, so I will have to do some reshaping later. 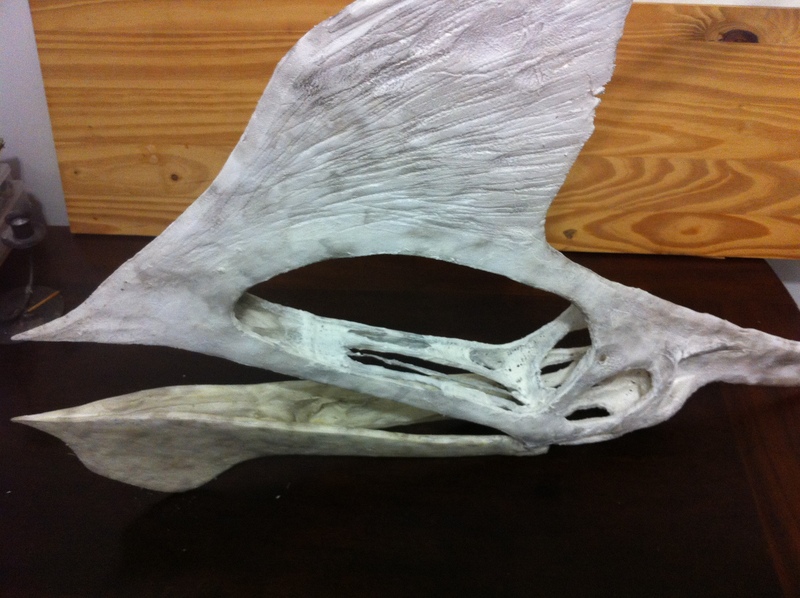 Here are some views of the upper skull. 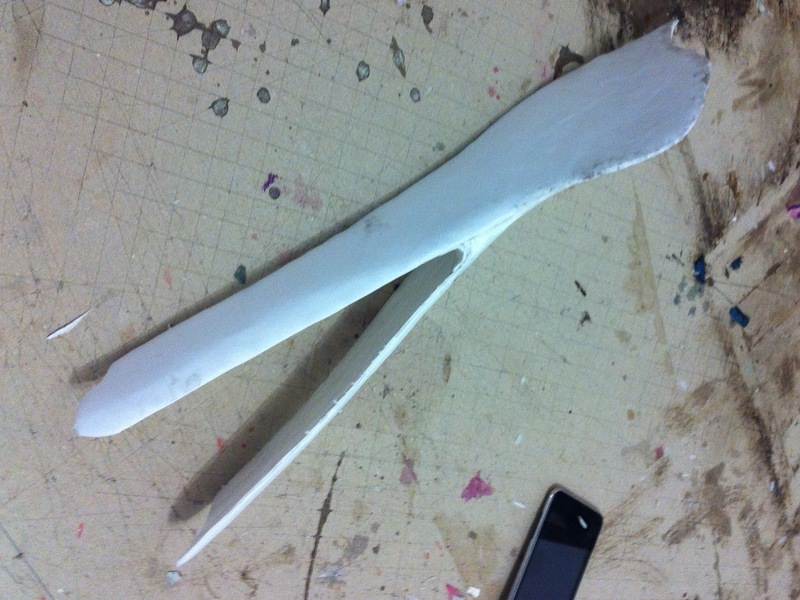 I used a lighter to change the texture of the foam with fire and to harden the surface a bit. 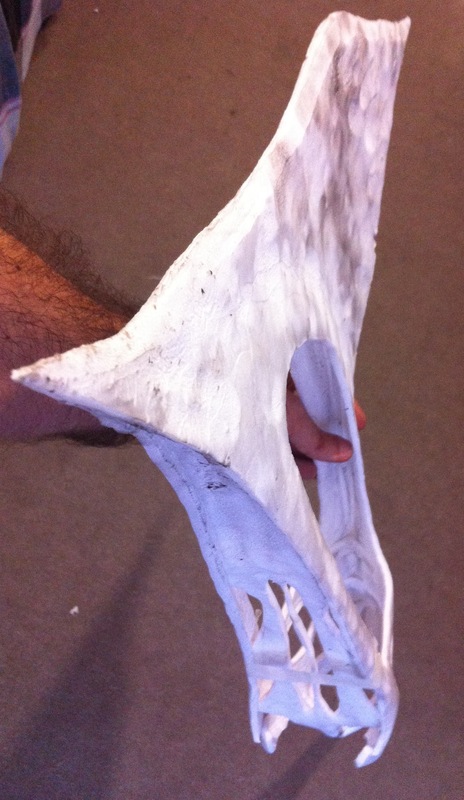 It also makes it look more like a bone. 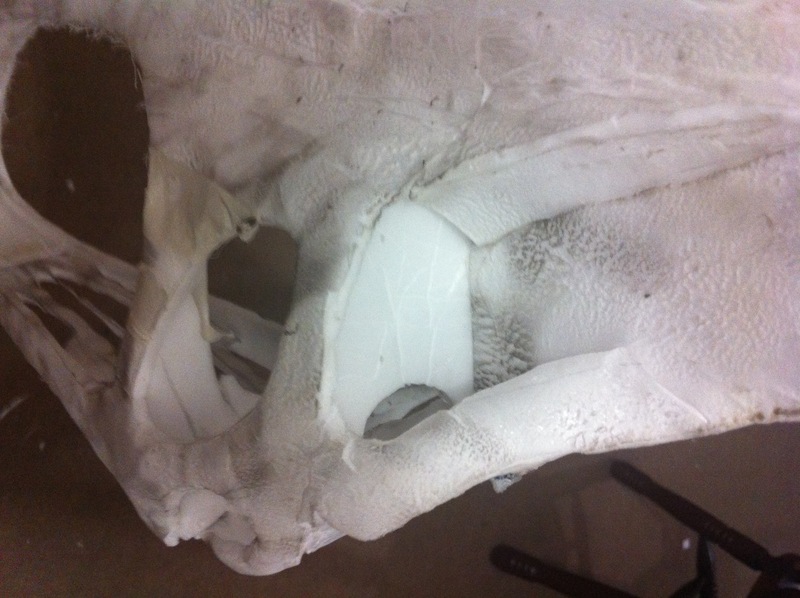 I can’t connect the mandible yet, but we can already see what it would look like. 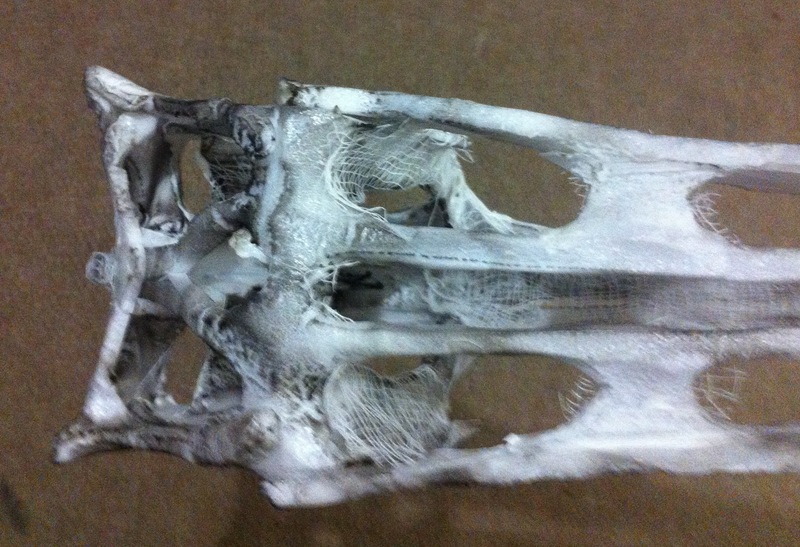 So this is the skull of the Tupandactylus imperator after two days of work. Not counting the time I spent on research nor the time I had to wait for the glue to dry, I spent, so far, 8 hours on this sculpture. 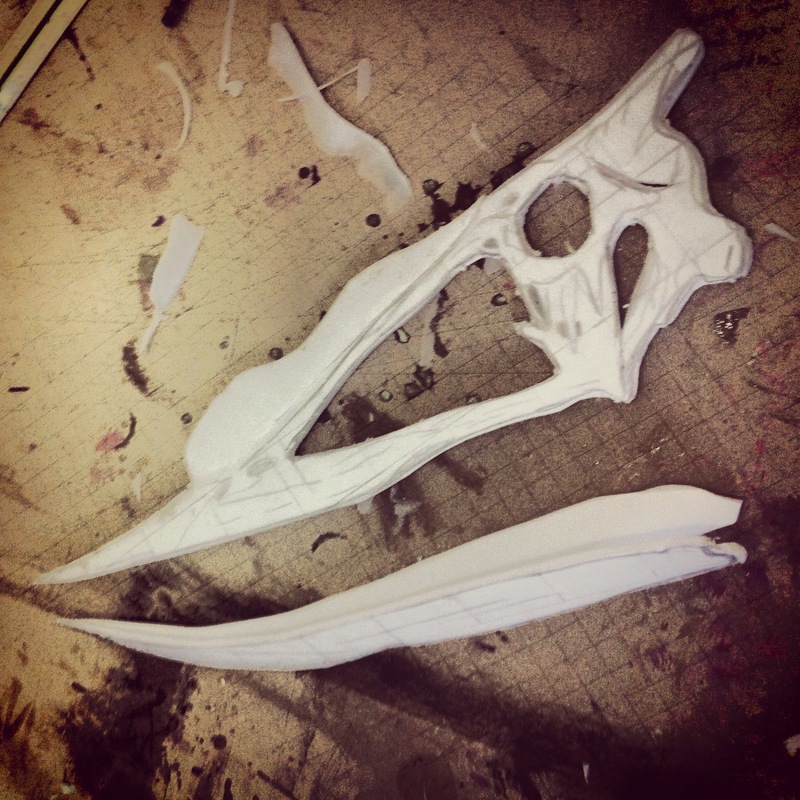 I will have much less time this week, but I believe it will be enough to finish this skull by Friday. Below is some information about my research. I first sketched the profile from this Tupandactylus diagram. Later I layered it with these two fossils: MCT 1622-R (on which it is based) and this other one. Other information I took from this Paleofile entry, this article by Campos & Kellner (2007), and this article by Pinheiro et al (2011). I used this Tapejara diagram for inspiration about what the Tupandactylus should look like when seen from above, and this drawing for an idea of what it might look from the front. 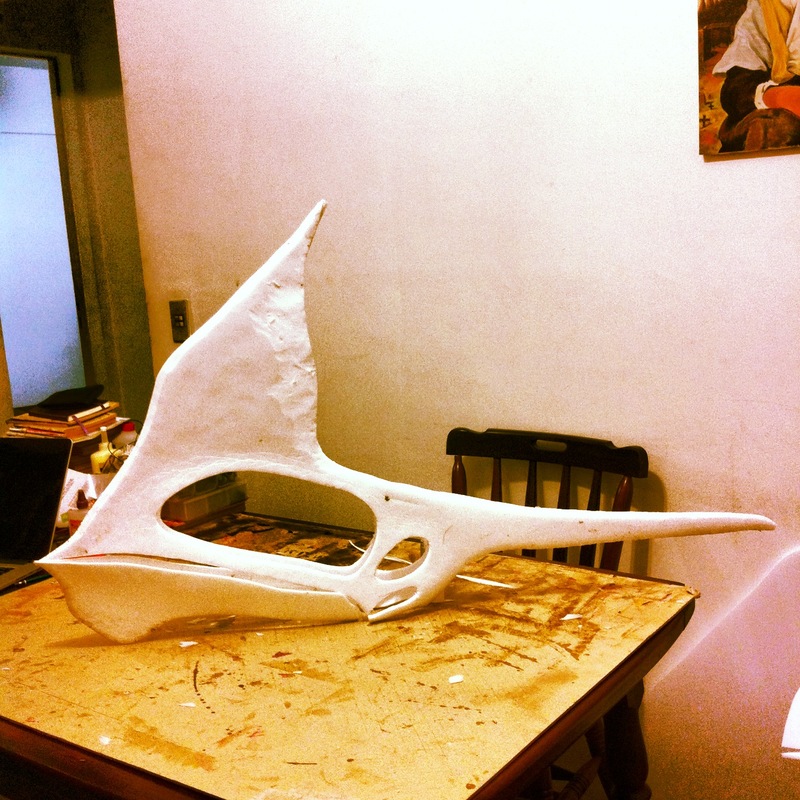 I also used this reconstruction of the skull of a Tapejara wellnhoferi, this fossil reconstruction of a Tupandactylus imperator and this picture of a Tupandactylus replica from Museu Nacional do Rio De Janeiro. Thanks to Hebert Bruno Campos for the links to several of the references above. 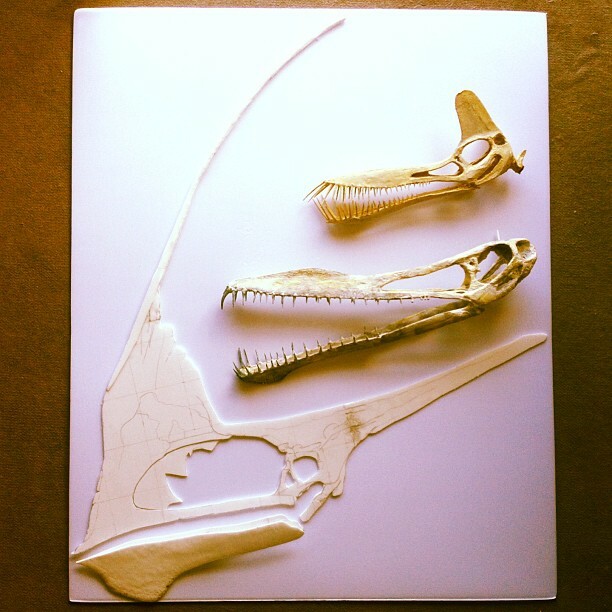 I found a Tapejaridae pterosaur in a board of foam! It’s a Tupandactylus imperator. I started with a 1.2 x 1.0 m board of XPS foam 5 mm thick. There aren’t so many Tupandactylus holotypes and there are none in good shape. I will have to guess, invent, and copy some solutions from Tapejaras. I started with a draft based on the best fossil. But I ran out of foam. 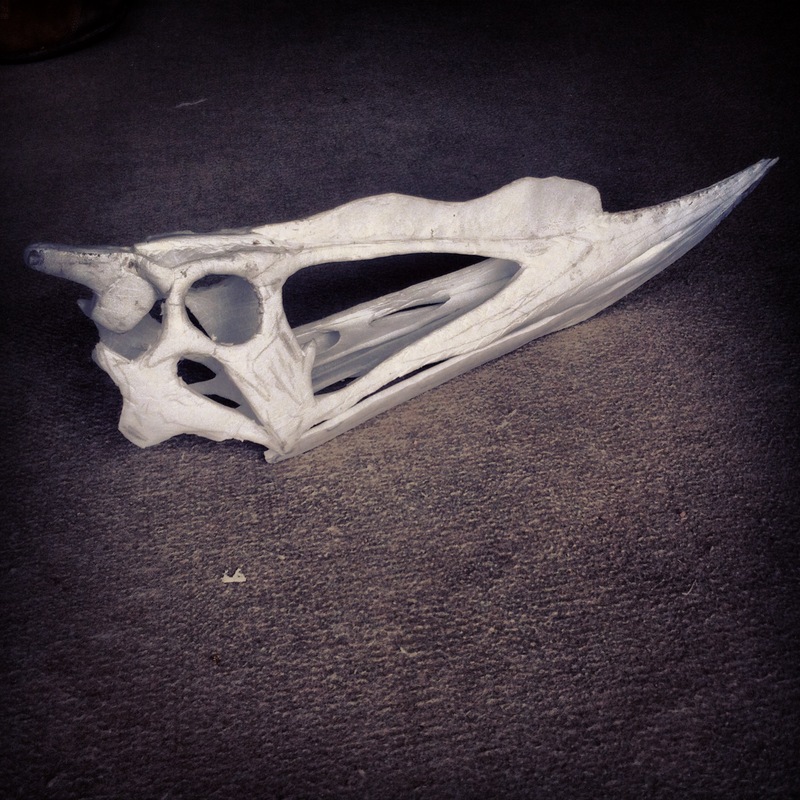 It was only enough for the mandible and half a skull. 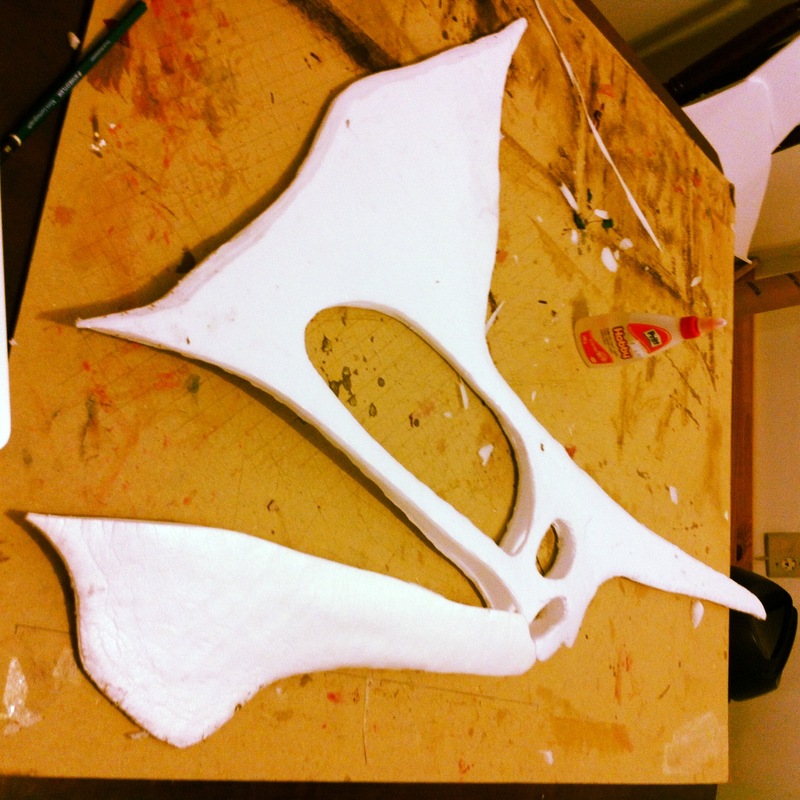 When I got more foam it was of a different kind, so I decided to cut out two new halves, without the full front crest (I will add it later) using the previous half as a guide. I also did some research and decided to leave the skull’s details out for now. 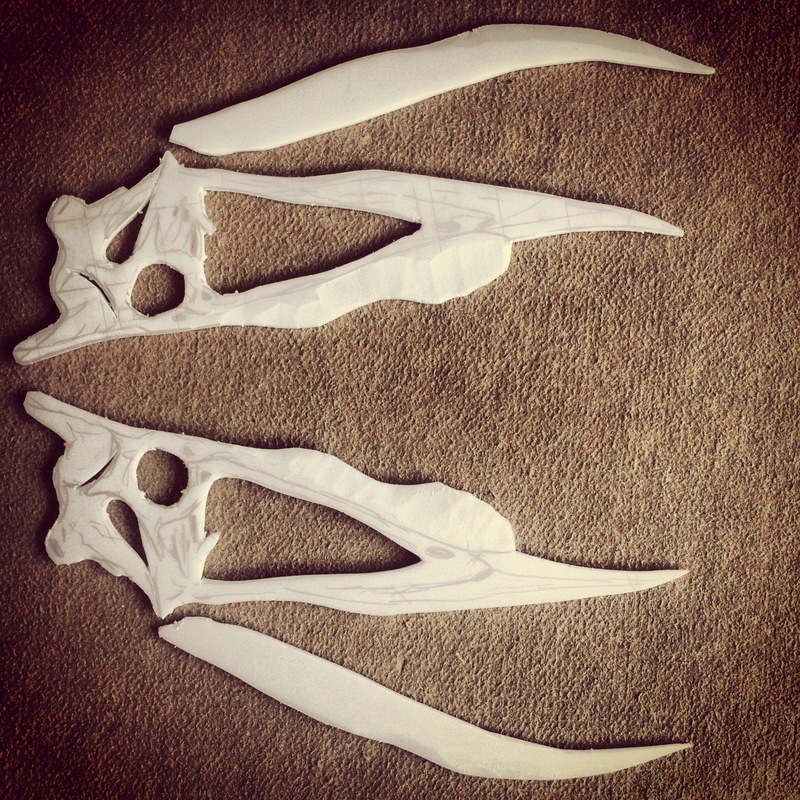 Before pasting the halves together, I trimmed the edges on the front and top of the crest to make it easier. 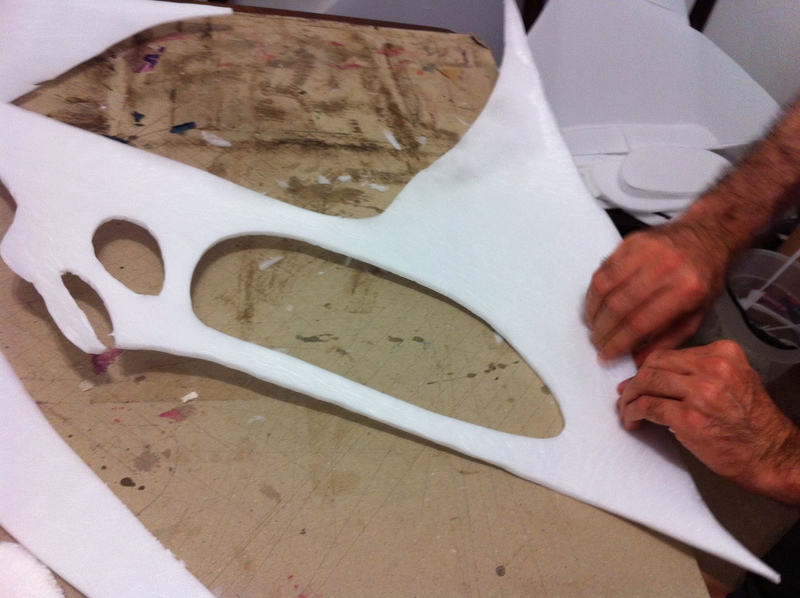 Then I folded the foam. This is important so it won’t crack when manipulated. You have to press and fold. You can even fold all the way if you do it right. After folding in one direction, in some parts, I folded in the other. 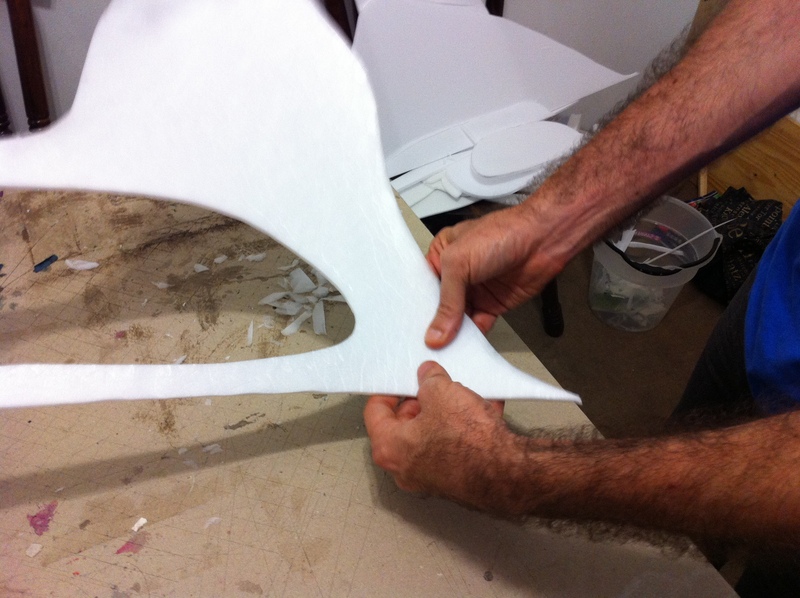 It becomes a lot easier to mold with this previous folding. Don’t forget to press before folding, or the foam will crack. 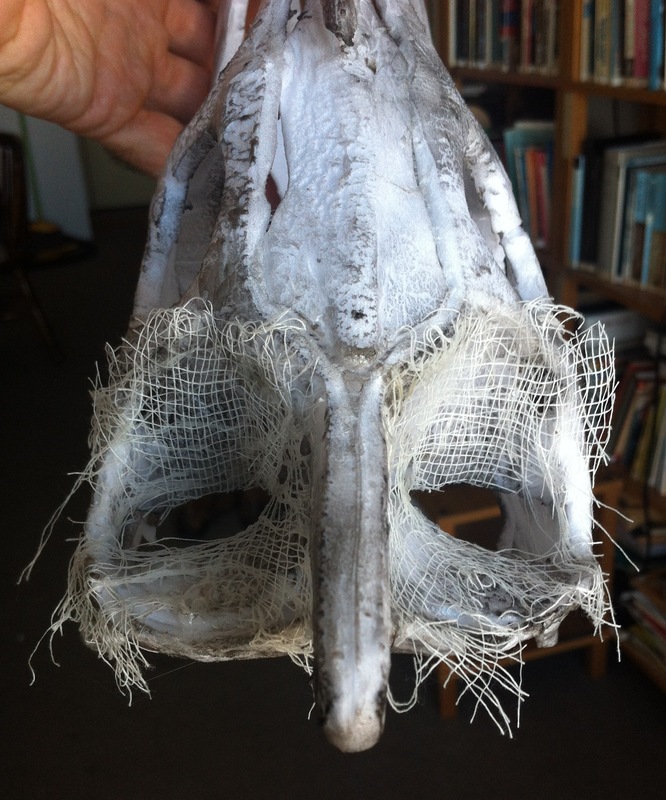 Do it until the foam becomes softer and easier to mold. The next step is to glue the halves together. 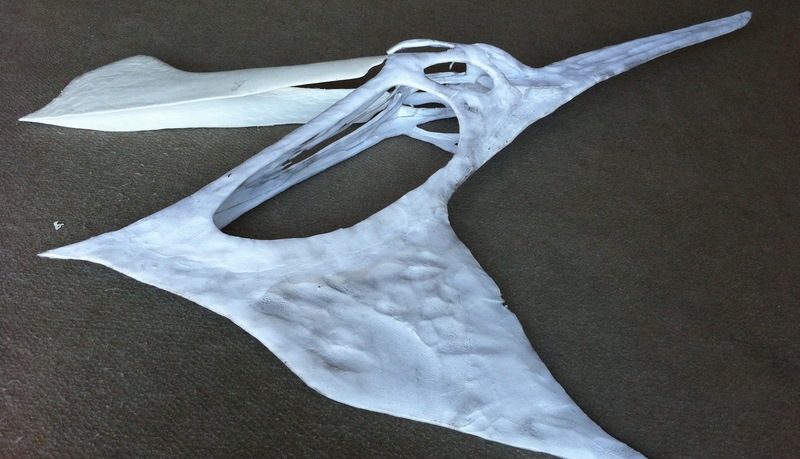 After adding glue on some edges and holding the parts together for a while, we finally have something that looks like a Tapejara. After drying, another hour of folding, and finally we have this. In the morning, after the glue dried a bit more, I cut a cavity behind the eye and now we finally have a 3D sketch to start working on.